Durga Puja is the most happening yearly thing that fine-tunes our mundane lives. Yes, you guessed it right, I’m a Bengali guy popularly addressed as ‘Bong’ by my interstate friends. Some of us who are settled out of the state flock back like sunset birds during this time of the year, and a good portion of Bengalis rooted to their soil take liberty of planning family trips during Durga puja holidays. I've always been a hybrid of these two categories and had planned for a simple family trip to Puri in 2013. But, the wicked ‘Phailin’ (a devastating cyclonic storm) dropped in from nowhere with all her glory and washed out our modest travel itinerary barely few minutes before we were about to board the train! It was a big disappointing story and certainly off-topic to this travel tale of Pandua, a historical town in the Hooghly district. Once you reach the fair-ground, the 125 feet high Pandua Minar will surely steal your gaze. The effect of Phailin was not pleasant though. Leave alone the coastal areas of Bay of Bengal, it had exerted its malicious effect even on regions 200-250 kilometers away from the coastline! It drizzled intermittently all through those four Puja days. While others agreed to put up with the whims of nature by staying at home with occasional pandal-hopping, I decided to make a brief day ride to some worthy nearby destinations. Exploring various well known corners of Hooghly seemed like the only feasible idea. Pandua, a tinsel town in Hooghly district, roughly fifty kilometers away from Bardhaman was my perfect starting stopover for the day. As long as the sweet chemistry between a man and his motorcycle exists, riding to new places is a cheese walk. Thus, my visit to Pandua was soon followed by quick rides to the Bandel Church, Hooghly Imambara and Hanseswari Temple at Bansberia. Well, each one of them deserves separate blog posts and I'll be doing just that. Adjacent to the minar lies the ruins of the Mosque of Pandua, popularly known as Bari Masjid. Once my two wheels touched the pamper ground of NH-2, the apprehension of an overcast sky evaporated out of my head and the motorcyclist inside me moaned in ecstasy! Good things seldom last long. Soon NH-2 had to be left for narrower state highway. On a positive note, this picturesque road through suburbs and villages provided me with abundant greenery to sooth my eyes. In little more than an hour my pony took me to the unsung historical town of Pandua. Alternatively, one can reach Pandua from Howrah or Bardhaman side through railways. Once you reach Pandua you'll have two monuments to visit, and good thing is that they are located at the same place. You have to ask from any local guy the direction of the fair-ground. This brick-made Minar has five storeys, diminishing in size as you go higher, with flutings in the lower three. Once you reach the fair-ground, the 125 feet high Pandua Minar will surely steal your gaze. But you will be sad by the extravagantly under maintained state of the monument. 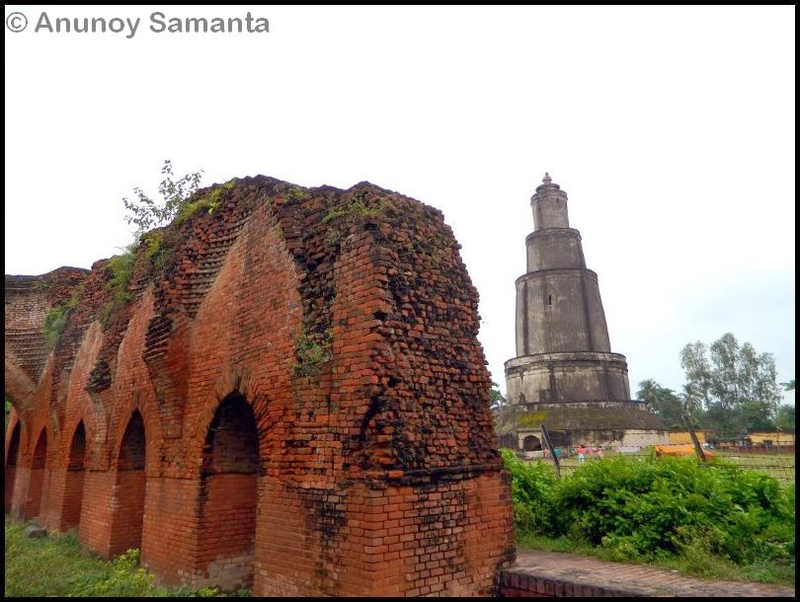 The fence put by Archaeological Survey of India has been torn apart at various points to facilitate the free wandering of cattle and dry domestic clothes, as if the colossal Minar was built for this purpose only! Rising to a height of 38.10 meters, the Pandua Minar was built possibly in 1340 AD by Shah Sufiuddin as a tower of victory. This brick-made minar has five storeys, diminishing in size as you go higher, with flutings in the lower three. 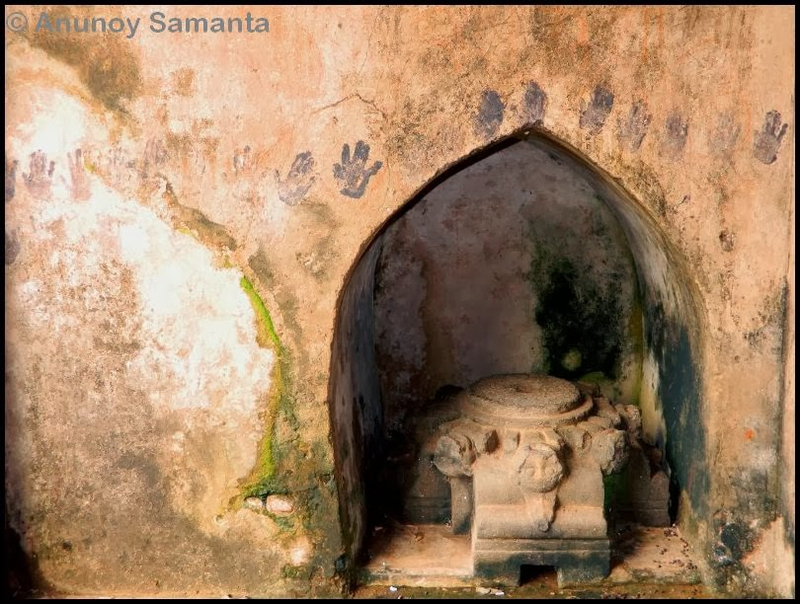 The entrance was provided with a stone door frame flanked on either side by carved stone pillars of some Hindu temple. Visitors are not lucky enough to climb up this minar due to the rusted lock on the main entrance. I was really curious to know who actually possessed the key to that lock. I could not find anyone who could possibly quench my curiosity. After all, who needs to know everything! 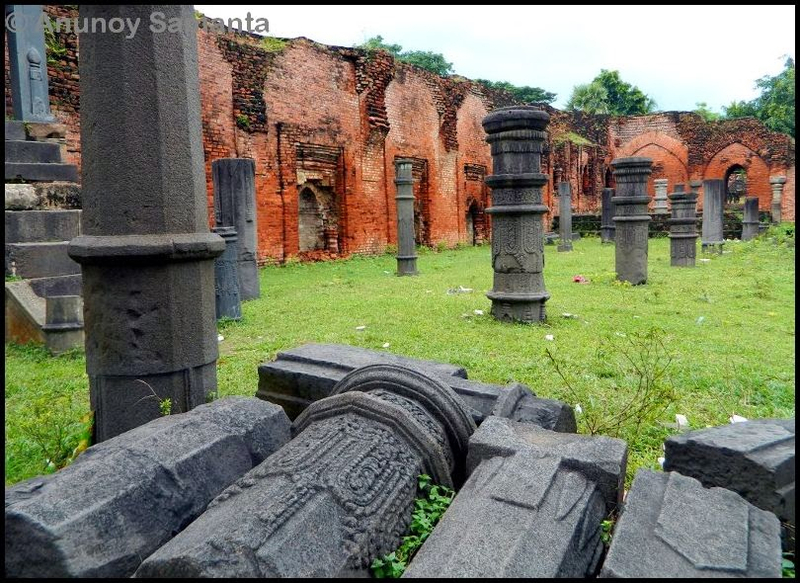 Adjacent to the minar, barely 50-70 metres away lies the ruins of the Mosque of Pandua, popularly known as Bari Masjid. 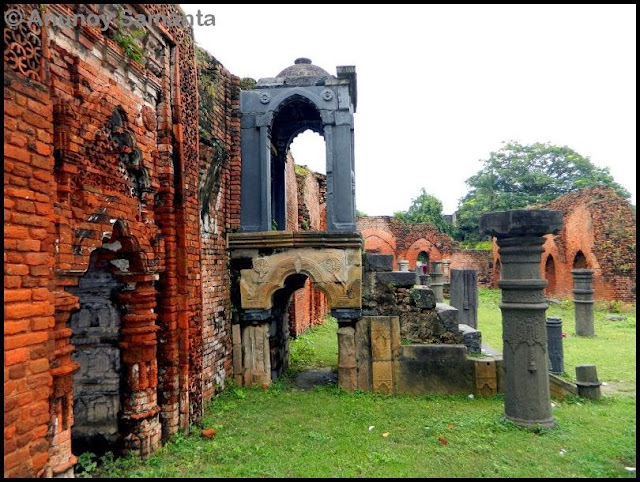 Bari Masjid, built by Shah Safiuddin in 1300 AD, is a prototype specimen of brick-type architecture of Bengal. Roof of this Bari Masjid had 63 small domes over brick arches resting on stone pillars of Hindu design. Bari Masjid is a long, low building measuring 70.41 meters by 12.80 meters, having 3 aisles with 21 door openings in front and three on sides. 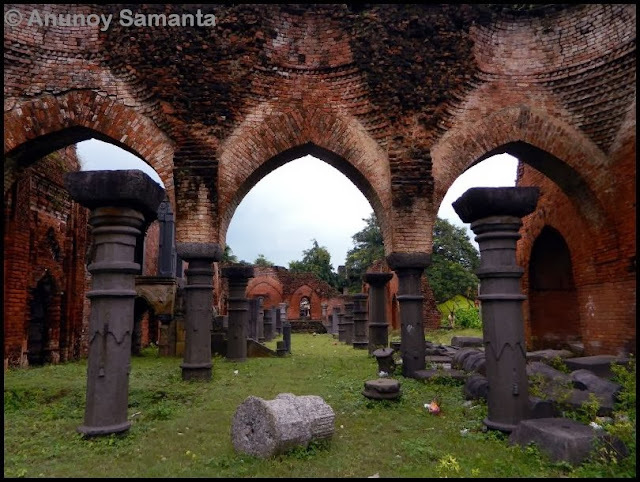 Its roof had 63 small domes over brick arches resting on stone pillars of Hindu design. A canopied platform is an attractive feature of this monument. In my short 30 minutes stay at Pandua I could spot only a couple of tourists who were photographing those ruins with their tablet. I made my camera to toil with some quick clicks and then left the fair-ground with a faint optimism- someday, all historical monuments scattered throughout this incredible India will be taken better care by our Government. My next destination was Bandel Church - the Basilica of the Holy Rosary. 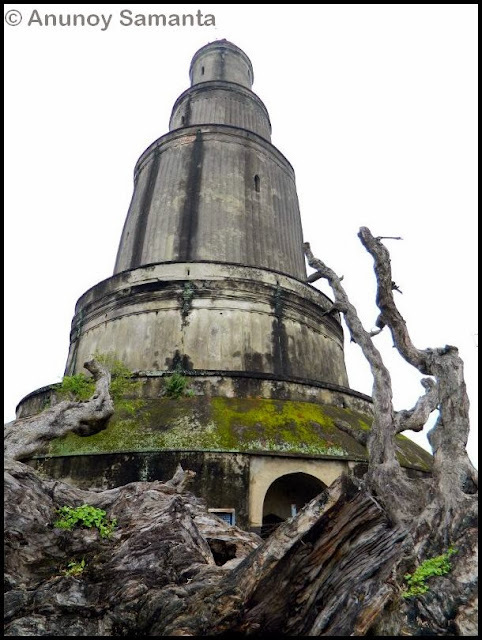 I've blogged about my visit to the Bandel Church in the subsequent post, so give it a read! Damn ASI. These people don't know anything about conservation, all they know how to loot public money in name of conservation. You have thousands of monuments and things scattered over the Delhi, but what they do, absolute nothing, they even don't know or forgot about things that exist. For them, looting public money matters. Though, people of India also contribute in disfiguring these monuments. You can see many spitting and littering around, locals don't hold any sense of pride in their local monuments, they are either busy in dismantling or encroaching the property. Unless we educate them, nothing will change.